This is not a review of Victor Hanson’s book, The Case for Trump. Rather, it is a passing comment on the treatment of “America First” in Hanson’s case for Trump. Yes, Trump’s America First vision triggered “the charge of isolationism” (not to mention apoplexy) from the Left, the Republican Establishment, sundry “progressives” and new world order types. All of the above had varyingly dominated American politics in the decades since World War II, pushing the country ever farther off of its foundations as a nation-state into the global system, whose institutional bases were, after all, established by a pair of Soviet agents, Alger Hiss (United Nations) and Harry Dexter White (IMF). Certainly, to these same globalists, it is safe to say that “the charge of isolationism,” as Hanson writes, “only cemented the slur against Trump,” which was spawned by vague but distasteful notions of “sullied” Lindbergh, as Hanson writes, and the America First Committee. It’s notable that Hanson, the Trump case-maker, seems to share this outlook. Indeed, he repeats their standard smears of Lindbergh and, by extension, the America First Committee. Why was Lindbergh “sullied”? Lindbergh, Hanson tells the reader, was “at best” silent as Hitler and Mussolini rose. “At worst,” he was a conspiracy theorist who blamed “international Jewry” and “British monarchists” for our entry into World War II. This is the rote interpretation of Lindbergh, as repeated by the Left, the Republican Establishment, sundry “progressives” and new world order types. A return to the record, however, shows this is unfair. It is unfair to dismiss the hero-aviator as “silent” in the 1930s when he made multiple trips into Nazi Germany at the behest of the US government to gain intelligence on the Nazi aviation industry. It is unfair to characterize Lindbergh as a conspiracy theorist about “international Jewry” and the rest. Doing so in ahistorical shorthand, however, is a quick way to ensure that America First retains its discredited and also disreputable aura. Hanson’s Trump “challenge,” then, would seem to be to distance Trump from it. He accomplishes this some pages later. In my view, the resurrection of “America First” was not only what made Trump’s candidacy unique in presidential history; it was not only the key to Trump’s success with the Deplorable Vote; it was also, and equally as important, a catalyst for the chain reaction that resulted in his Marxist enemies in and around the Deep State going nuclear on him and attempting a coup against his presidency. Why? Marxism is a common driver of revolutions and coups, successful and failed, over the past 170 years (and before that it was called something else). Throughout the 20th century, Moscow was the main instigator and enabler of these same aggressions, and especially so within the United States. Many people still recognize this as the “boring from within” cancer of international communism and socialism, even as they assume it all vanished when the Soviet Union dissolved in 1991. Enter Donald Trump, a quarter century later, single-handedly reviving the greatest weapon never deployed against international communism and its globalist descendants: America First. Whether anyone recognizes it (including Trump himself), Donald Trump is America’s most anti-Communist president ever, bar none. Not even Ronald Reagan’s anti-communism exceeds Trump’s, tempered as it was by Reagan’s “internationalism” and commitment to “free trade,” both of which are positions that have been easily subverted by communism to undermine the national interests of the USA. Trump without America First isn’t Trump. But even the Lindbergh story of America First and antiSemitism doesn’t hold up under scrutiny—certainly not on delving into the details of the organized smear campaign against the famous aviator. What is important to note is that these recent debate-stopping buzz words are the same ones that dogged “America First” back at the beginning. 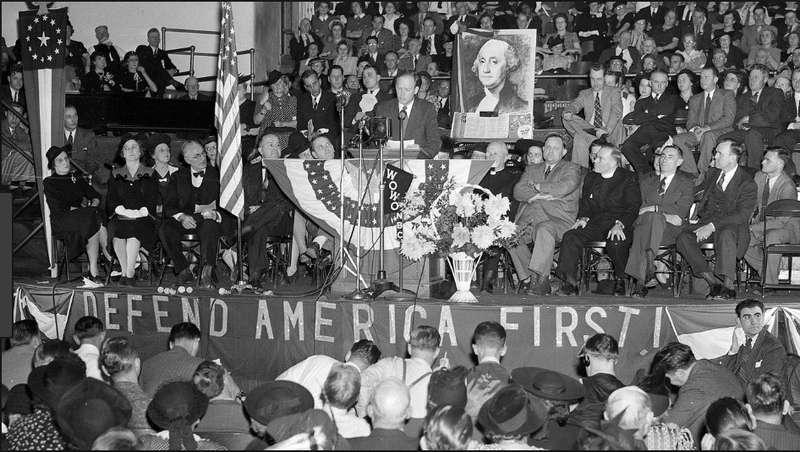 Reading into the documents and speeches and letters of the America First Committee and wider movement, however, I see none of these poisons driving the principals. They did see an officially neutral America as having separate interests from the rest of world – and very likely, they would relate to Trump’s border wall and Muslim immigration moratorium, but would fail utterly to understand how we ever came to need them – but their concerns, agree with them or not, were not to appease Hitler and advance anti-semitism, as we are incessantly told. They discussed constitutional matters; American liberties and their loss during a state of “war socialism” and regimentation; Congress’s war powers, which they saw being seized by a usurping chief executive. They also discussed their sons’ lives, which they did not want to see lost by the ten thousand. After Germany attacked the Soviet Union in June 1941, they were also gravely concerned about an American alliance with one totalitarian monster, Stalin, to defeat Hitler, another totalitarian monster. Better to let them fight each other, some said. I ponder the impact on US policy-making and war-making that this same Soviet intelligence army of over 500 confirmed agents inside our government and related institutions might have had. It was considerable. It was also cataclysmic.) As for the charge of shortsightedness, Sen. Robert Taft sounds not a little clairvoyant when in 1941 he asked: “Will that part of the world which Stalin conquers with our airplanes and tanks be consecrated to freedom [of speech and religion and the rest]? Or, after a Russian victory with our aid, must we step in with our armies to impose the four freedoms on 200,000,000 people 10,000 miles away…?” At the very least, the namecalling is not the full story, then or now; nonetheless, it always ends the discussion. This pattern is typical. It begins with buzz words and the strictest platitudes. For example, one is “Islamophobic” if one rejects the statement, “Islam is a religion of peace”; one is a “Red-Baiter” or “McCarthy on Steroids” if one demonstrates that the “Red Scare” was no “scare” at all but rather a Red Reality subverting our republic. 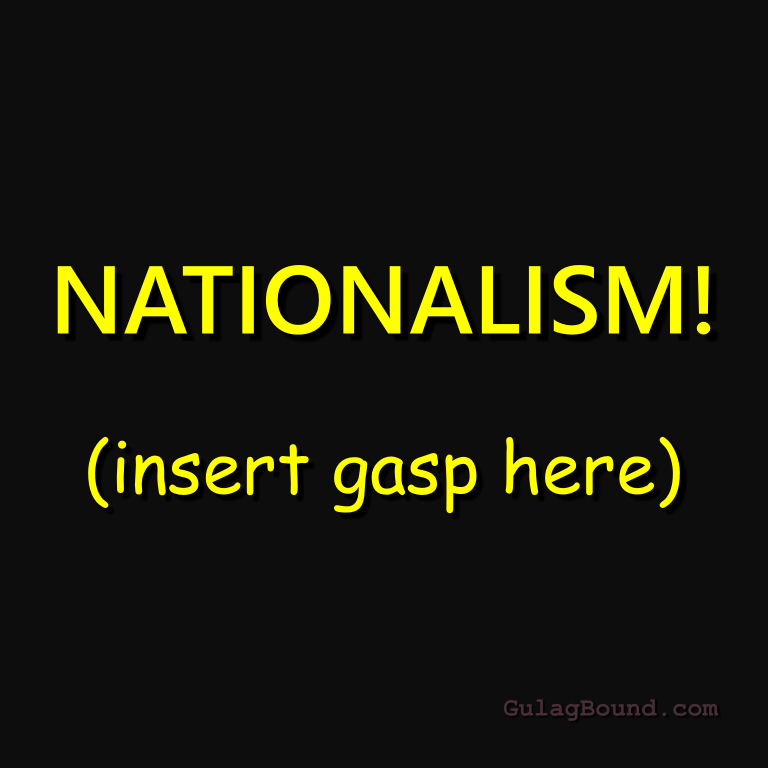 Just so, one is a Nazi or a “nativist” (whatever that is), if one is for America first. Chilling effect follows. But not for Donald Trump. My foreign policy will always put the interests of the American people and American security above all else. It has to be first. Has to be. That will be the foundation of every single decision that I will make. America First will be the major and overriding theme of my administration. More poison protest headlines followed. But consider for a moment what it means when the presumptive Republican nominee for president of the United States makes waves by declaring he will put America first in formulating his policies; and, further, has to explain what it means to do so; and, then, on the whole, is met with derision, outrage and fear on the part of commentators and politicians and academics and the like – no matter where on the political spectrum they may have located themselves. We will no longer surrender this country or its people to the false gods of globalism. The nation-state remains the true foundation of for happiness and harmony. I am skeptical of international unions that tie us up and bring American down and will never enter [them]. This is nothing less than a declaration of war on globalism—on the New World Order, on One-Worldism, internationalism, and multilateral this and that. It seems to echo some long lost chord of anti-Communism, too, and even buck unseen Marxist currents. At least so it strikes me. But we don’t talk about such things anymore. What Trump has done is revive an old struggle in American politics. It is a struggle the adherents of America First have always lost. Trump’s completely unexpected political success to date, however, tells us this is not an idea whose time is indisputably past—as we have all been so forcefully taught.